Located in Las Vegas Strip, The Venetian Resort Las Vegas is a leisurely stroll from popular sights such as Fashion Show Mall and Sands Expo Convention Center. This 4028-room, 5-star resort has 11 outdoor pools along with a full-service spa and a casino. It's connected to a shopping center in central Las Vegas and also close to Las Vegas Convention Center and T-Mobile Arena. This resort is home to 20 onsite restaurants, perfect for a quick bite to eat. Savor a meal from the privacy of your room with 24-hour room service, or get a pick-me-up at the 6 coffee shops/cafés. Full breakfast is offered for a fee each morning from 5:30 AM to 11:30 AM. Guests can expect to find WiFi, wired Internet, and 46-inch a flat-screen TV with pay movies. Pillowtop beds sport Egyptian cotton sheets and down comforters, and the bathroom offers a soaking tub, a hair dryer, and designer toiletries. Other standard amenities include a sitting area, a minibar, and free newspapers. The Venetian Resort Las Vegas features a full-service spa, 11 outdoor pools, and a casino. There's free valet parking, and an airport shuttle (available 24 hours) for USD 8.50 per person one way. The 24-hour front desk has multilingual staff ready to assist with luggage storage, dry cleaning/laundry, and concierge services. Other amenities at this luxury resort include a nightclub, a fitness center, and a spa tub. 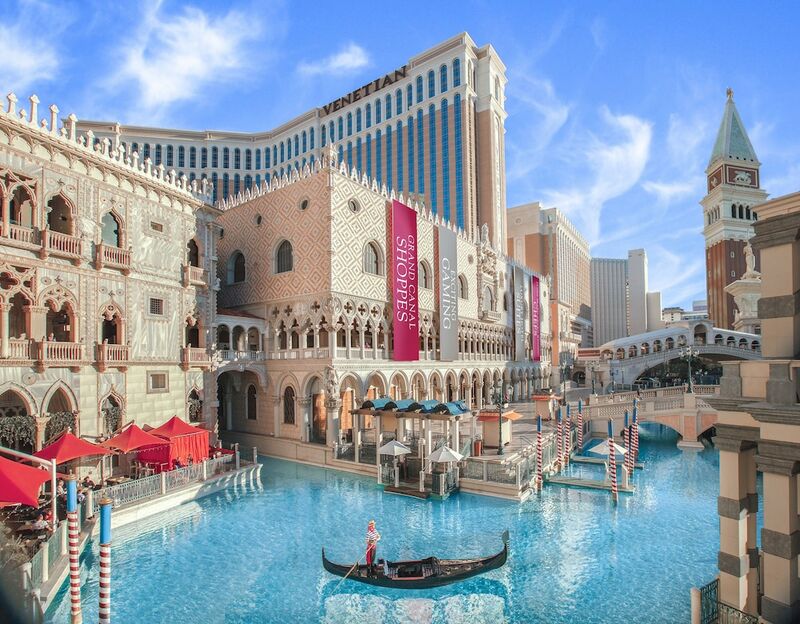 The Venetian Resort Las Vegas offers 4028 air-conditioned accommodations with minibars and laptop-compatible safes. Accommodations offer separate sitting areas. Pillowtop beds feature Egyptian cotton sheets, down comforters, and premium bedding. 46-inch flat-screen televisions come with pay movies. Bathrooms include separate bathtubs and showers with deep soaking bathtubs, bathrobes, slippers, and designer toiletries. In-room wired and wireless Internet access is available for a surcharge. Business-friendly amenities include desks, complimentary newspapers, and phones. Additionally, rooms include hair dryers and irons/ironing boards. In-room massages and hypo-allergenic bedding can be requested. A nightly turndown service is provided and housekeeping is offered daily. The Venetian Resort Las Vegas has 20 restaurants serving breakfast, lunch, and dinner. Start your morning with a full breakfast, available each day from 5:30 AM to 11:30 AM for a surcharge. Room service is available around the clock. 11 outdoor swimming pools are on site along with a spa tub. Other recreational amenities include a sauna and a fitness center. Guests can indulge in a pampering treatment at the resort's full-service spa, Canyon Ranch SpaClub. Services include deep-tissue massages, hot stone massages, sports massages, and Swedish massages. A variety of treatment therapies are provided, including aromatherapy and reflexology.